, one of the world’s foremost geothermal technical gatherings. Stanford’s Geothermal Laboratory, led by Professor Roland Horne, has been investigating novel single-well approaches to Enhanced Geothermal Systems (EGS), sponsored by a research grant from Google’s RE<C initiative. Currently, for every well that sends cold water down to the hot rock (called injectors), there are one to three wells that bring heated water back up to generate electricity (called producers). But what if one well could act as both an injector and producer? It could dramatically lower the cost of EGS (example below). The Stanford team, which included graduate students Zhe Wang and Mark McClure, modeled a variety of single-well configurations to determine their feasibility. 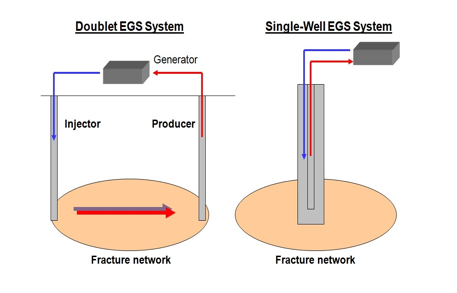 The investigation determined that on a per well basis, an optimal single-well EGS system would produce four times more energy than an isolated pair of wells and two times more energy than an infinite series of alternating producers and injectors. Single-well systems, when combined with advances in reservoir engineering, present another innovative technique for advancing baseload EGS on the path to RE<C. Next week Stanford University will host the 36th annual Stanford Geothermal Workshop, one of the world’s foremost geothermal technical gatherings.